As I posted previously, I've dropped my Palm Pre and am now using the Samsung Epic on the Sprint network. 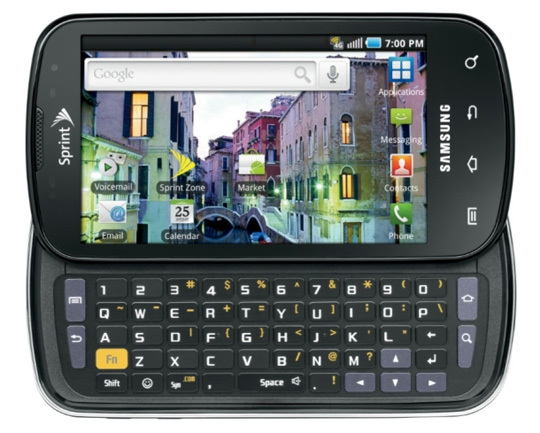 It's Sprint's second 4G phone, following the release of the HTC EVO this past summer. I was a Samsung user a while back with the Instinct and I've got to say that I like the hardware that this company makes. So far it just flat works and feels good in my hands to boot. DALLAS--(BUSINESS WIRE)--Samsung Telecommunications America (Samsung Mobile)1, the No. 1 mobile phone provider in the U.S., today announced that third party research firm Gartner® reported Samsung as the top Android smartphone provider in terms of sell through to end users in the United States for the third quarter of 20102. According to Gartner, Samsung Mobile captured 32.1 percent of the U.S. Android smartphone market in Q3 2010 based on retail sales, an increase from 9.2 percent of the Android smartphone market in Q4 2009. Samsung Mobile attributes much of the success to its Galaxy S portfolio of premium smartphones, which recently passed the three million shipment milestone in the U.S. Galaxy S smartphones are currently available with AT&T, Sprint and T-Mobile and Verizon Wireless, along with U.S. Cellular and Cellular South. The Samsung Galaxy S portfolio is packed with premium features and services, including a brilliant 4-inch Super AMOLED display screen, 1GHz Hummingbird Application Processor, Samsung’s Media Hub premium movie and TV programming download service and a full array of entertainment, messaging and social networking capabilities. The Galaxy S portfolio will be upgraded to the Android 2.2 (Froyo) operating system in the near future. For additional information on the Samsung Galaxy S portfolio, please visit www.samsung.com/galaxys. 1 Number one mobile phone provider in the U.S. claim for Samsung Mobile based upon reported shipment data, according to Strategy Analytics, Q3 2010 U.S. Market Share Handset Shipments Reports.